Bill Gates interest in Virtual worlds is growing…What does this mean for the future of web? A little while ago I read about a Virtual World called Vivaty and was a bit excited about where they were going with the premise. The thought behind Vivaty was that, in a Second Life-esq (Yes I just made that word up ) way it would allow it’s users to become a part of a 3D environment. Vivaty seemed to merge a 3D environment like Second Life with Social Media. Imagine my excitement as a lover of Second Life and Social Media. I was in Cool Nerd heaven at the thought. Notice that I keep speaking in the past tense. Well, I recently read that Vivaty went to the 3D world afterlife as in gone, finished and no longer operating afterlife. My disappointment was GREAT until I read that the one and only Bill Gates purchased Vivaty. This led me to believe that not only was there hope for me being able to experience Vivaty for myself, but that the future of Virtual Worlds just became a bit brighter. 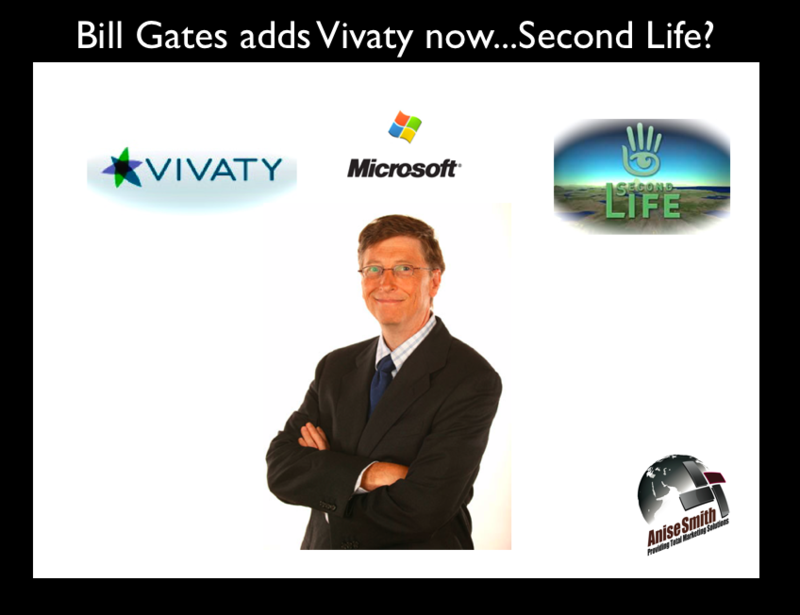 I have been reading more about the purchase of Vivaty and I discovered that Bill Gates is strongly pursuing purchasing Second Life as well. Wow and double WOW. If this is indeed the case the future of Virtual worlds may very well be brighter than anyone ever imagined. I have been reading that 3D environments will be play a large role in the future of web because they allow users to immerse themselves in their web experience. It seems that we may indeed go down this path if these acquisitions are any indication. I am looking forward to what comes next. Read more about the purchase of Vivaty and possible purchase of Second Life. Also, you can also visit Anise Smith Marketing on the web and on Second Life.